Now a monthly magazine! 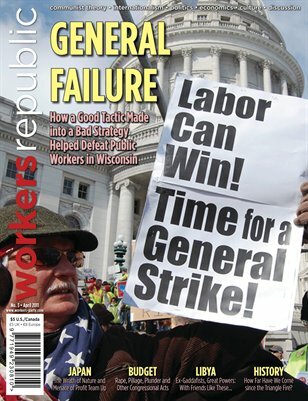 This issue includes articles on: the use of the general strike slogan during the struggle in Wisconsin; the earthquake, tsunami and nuclear crisis in Japan; the latest battle over the federal budget; the rebel uprising in Libya; treatment of Pvt. Bradley Manning; Robert Reich and the economy; remembering Leonard Weinglass; dispatches from workers' struggles; and, a review of the progress workers have made since the 1911 Triangle Shirtwaist fire.